I had to post this. The first thing I thought of was HO Studley. 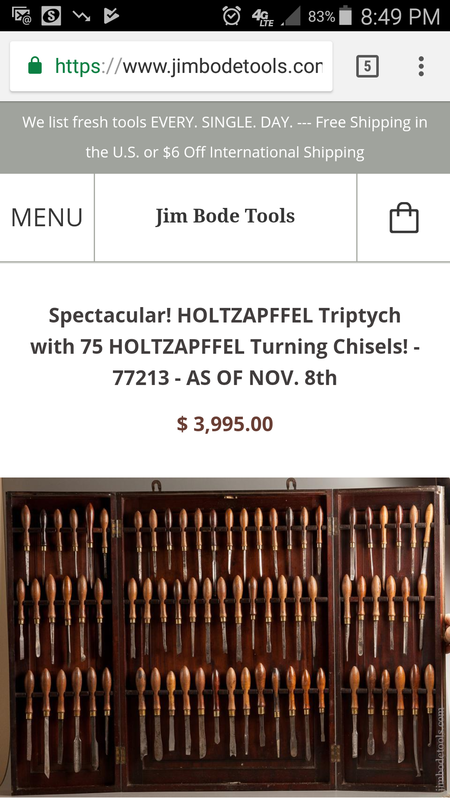 The description at Jim Bode says that Holtzapffel was a high end tool and lathe maker that sold it’s last lathe in 1928. Does this case predate HO Studley? Did he see one in the high end piano shop he worked at and then copy the form for his tool chest? Am I just nuts? A quick Google for Holtzapffel lathe turns out some pretty ornate pictures. You decide. I couldn’t take it any more. Our ikea cutting board looks like a potato chip. 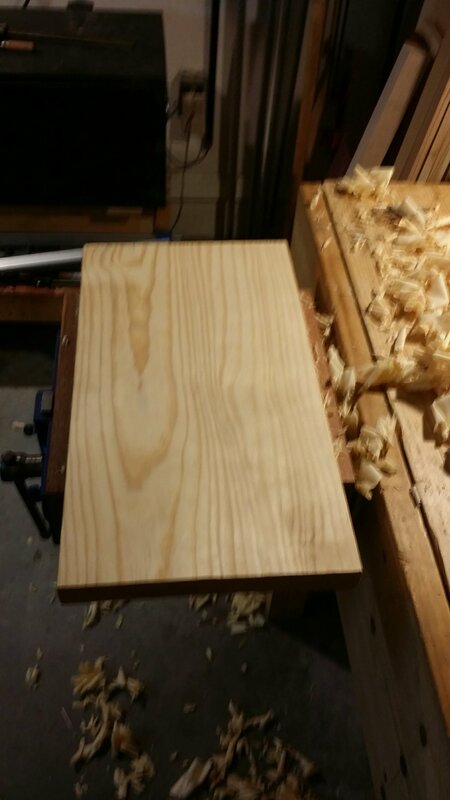 So tonight I looked at my cut off pile and found a 24 inch southern yellow pine 2×12 cut off from the bench aprons. It’s been sitting for over a year and had cupped a little. 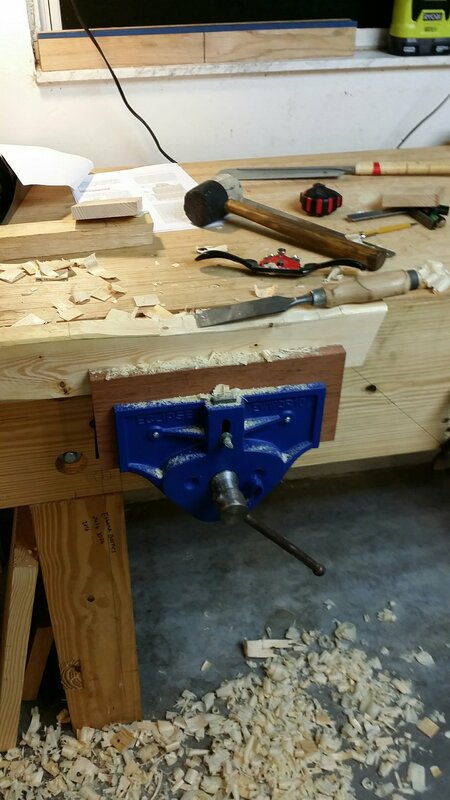 I started on the bench top with the planing stop but then I thought, what the heck try the vise. Ohh what a joy. 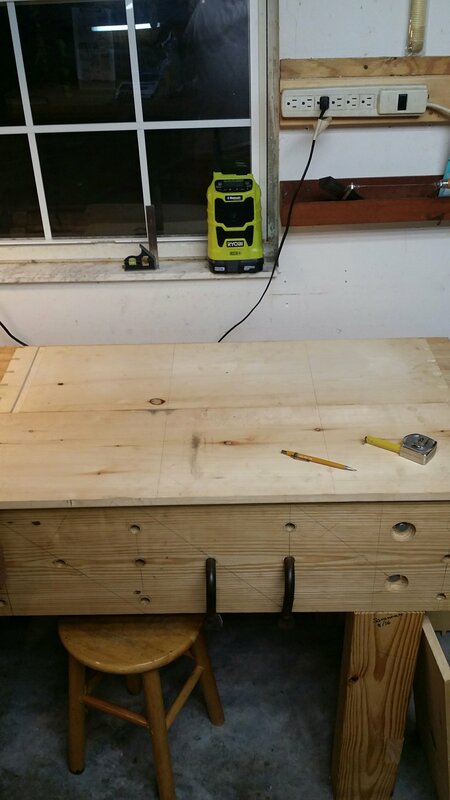 My bench is only 5 feet long, but it’s heavy. 5 inch thick 24 inch wide top with laminated 2x6s legs and 2×12 aprons front and back. This is one of those times when you realize all the work making a proper bench was worth it. AND THE VISE! I’m so glad I went with the ten inch. It’s massive and has a huge depth. The leather on the jaws held the wood solid and I just went to town. 5 minutes and I had it flat and all the machine marks out. If you are thinking about a bench build, just do it. You won’t know what you’re missing or how much you struggle with work holding until you have one. 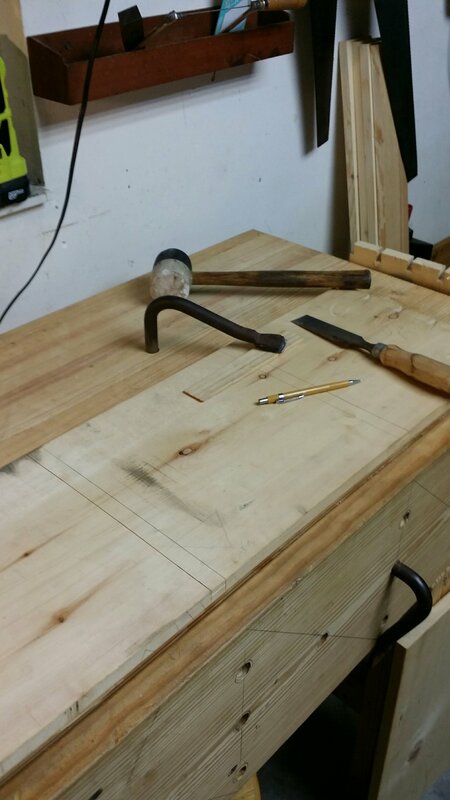 It so hard to realize, but my bench and vise are probably my first and second most important hand tools. 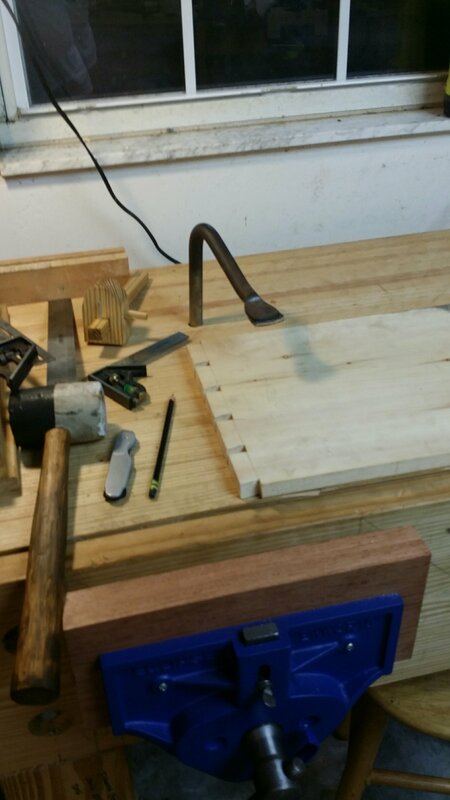 Soon to be a cutting board. Oh yeah, I put trewax on this plane after scrubbing off all the rust and sharpening the blade. We’ll see how much rust protection I get. It took me longer to clean the plane than to flatten the board, man I love my vise. That’s the first number 4 I ever bought. Recently, while planing some syp for my marking gauge project I broke the tote. I wasn’t pushing hard or taking a deep cut. It just broke. I’ve had a few weeks to think about it. At first I was frustrated. The seller had really seen me coming. 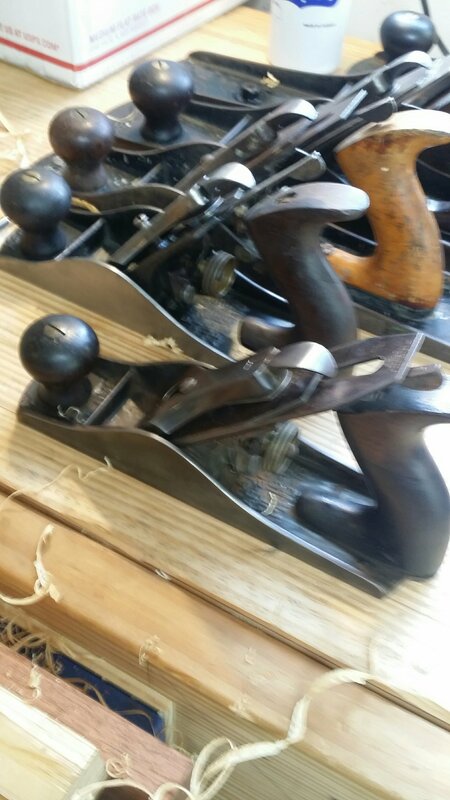 They had taken a modern stanley, you can tell by the blue paint, and added a sweat heart iron and a low knob off of something and grafted them together to sell me what I thought was a vintage plane. Don’t ask what I paid, it was too much. I’ve grown a little wiser and now I know what to look for. 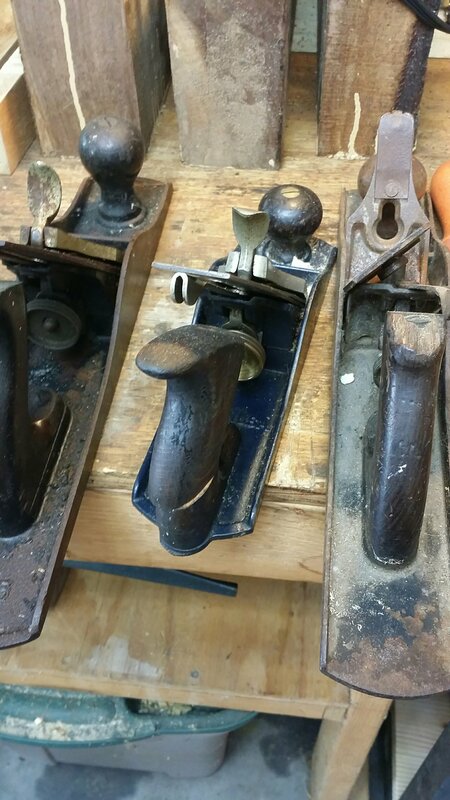 That said, I learned how to sharpen, setup and plane with my Franken plane. It served its purpose. It also made me realize that I preferred low knobs over tall knobs. When it broke it galvanized my nerve. I decided to hunt up a new number 4 type 11 with the vee logo. I went to Jim Bode tools and had a perfect one on the way for 95 dollars. Cheap. 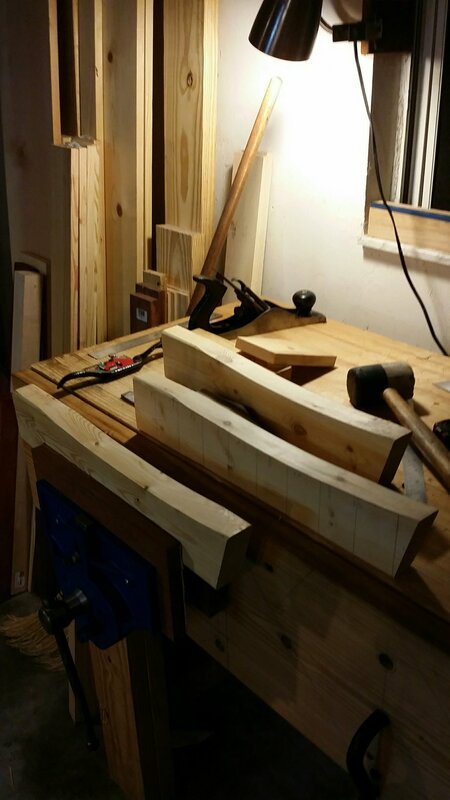 When I started with hand tools I was about to buy a caninet saw for 2500 dollars. 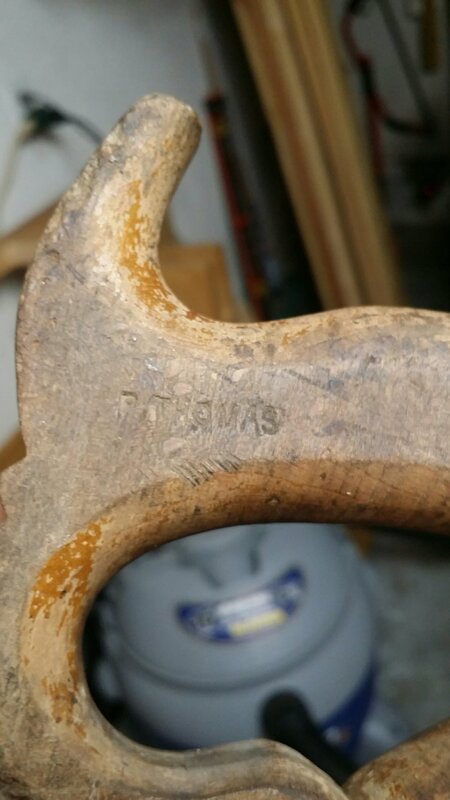 I can tell you I have all the hand tools I need and I’m not at 1000 after 4 or 5 years. With that said I was recently presented with a compromise. I found a number 3 type 11 that was mint to me. It was on ebay so I was nervous l, but the pictures were great. It only had one flaw. So I gambled and spent the 30 dollars. I was the only bidder. The flaw was too much for others, I guess. To me it made me like the plane even more. On May 16, 1920 the owner had stamped or punched his name in the side. When I bid on it I thought I’d lap it out, but I’ve decided to keep it. The plane is emaculate and looks hardly used. No one wanted it and I’m glad to have it and use it for the rest of my life and care for it so it sees another 100 years. Like I said it’s all a matter of perspective. 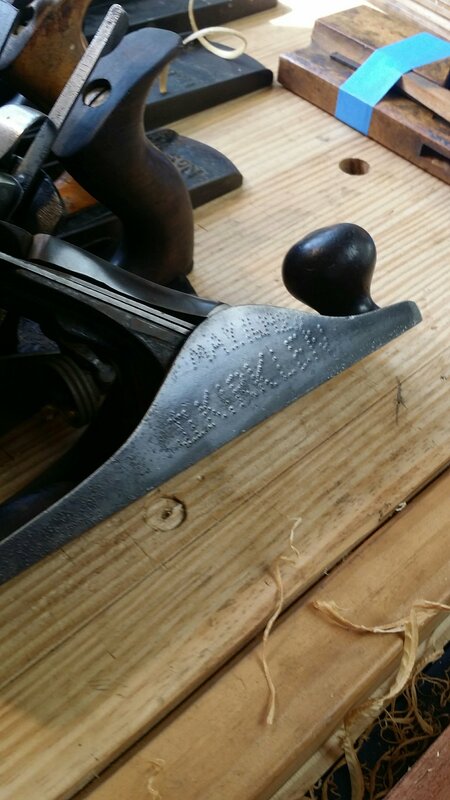 I wrote this post to let others like me, starting the hand tool journey, know to be patient with themselves. You will get screwed on ebay. Live with it. Find the positives in broken totes and ruined work. It’s all part of the journey. And if you find an old tool no one wants, take it home and love it and make it yours. Here she is with her new family. I like the British housing joint name, plus my my phone keeps trying to autocorrect dado. Maybe it knows something I don’t know. Here it is holding it self off the bench. Self supporting as Paul Says. After cutting all the ones for my bookshelf I think I’m getting pretty good. Here she is. I still have to glue up, but I’m pretty happy. This is the largest dovetailed case I’ve ever made. 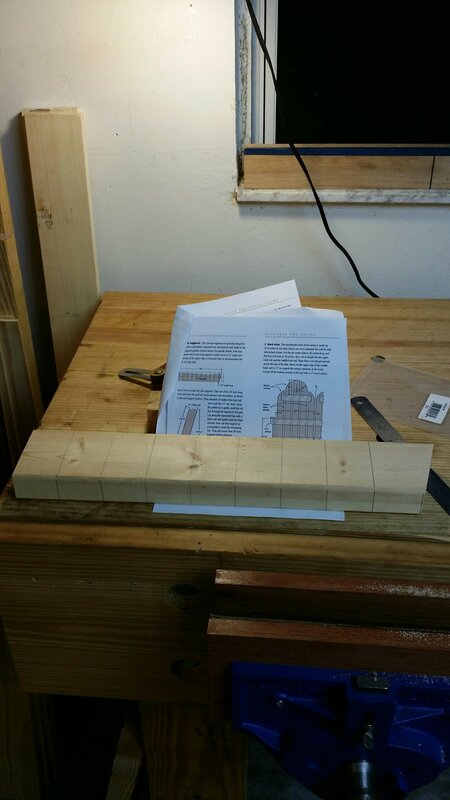 Here’s my first dado/ housing joint in progress. Started with the layout. Here’s the cabinet apart. I spent some time playing with cauls the other day after a suggestion by Matt McGran. I still need to figure out a good way to clamp up. I need to make better cauls that don’t interfere with the tails and pins while clamping. I think this is an important step. 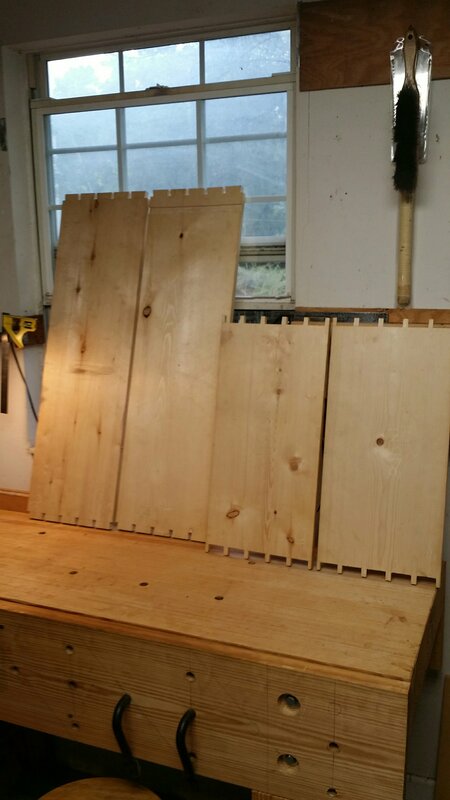 Layout the dados on the sides at the same time. This visually made me feel more confident to chop. I have known the new woodworker fear of destroying a piece of work. As I get better that fear is diminishing, but I’ve found that solid layout has been one of the factors in making my chopping and cutting more confident. 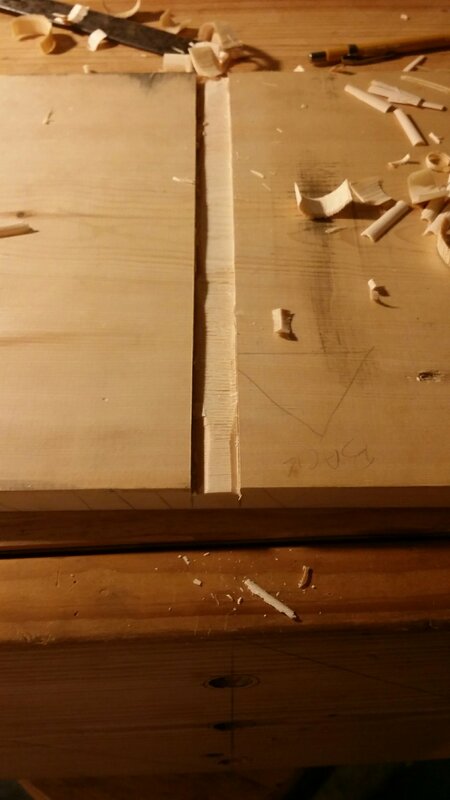 All I can say to new woodworkers is to try and become the best at layout that you can. 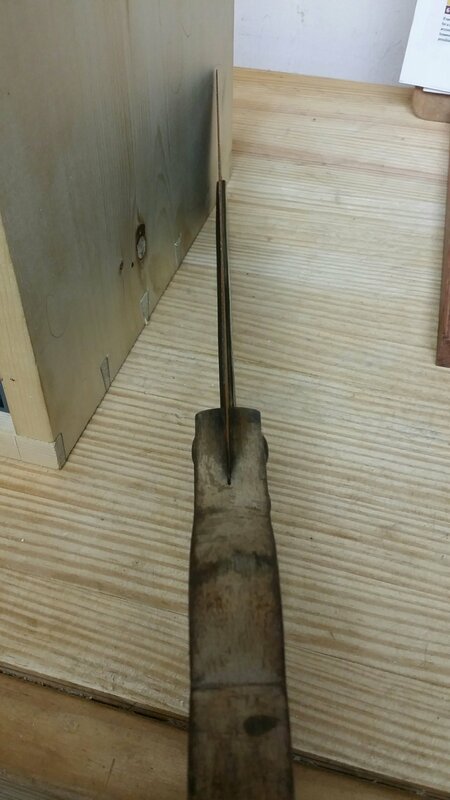 Maybe that’s the first handtool skill to master. 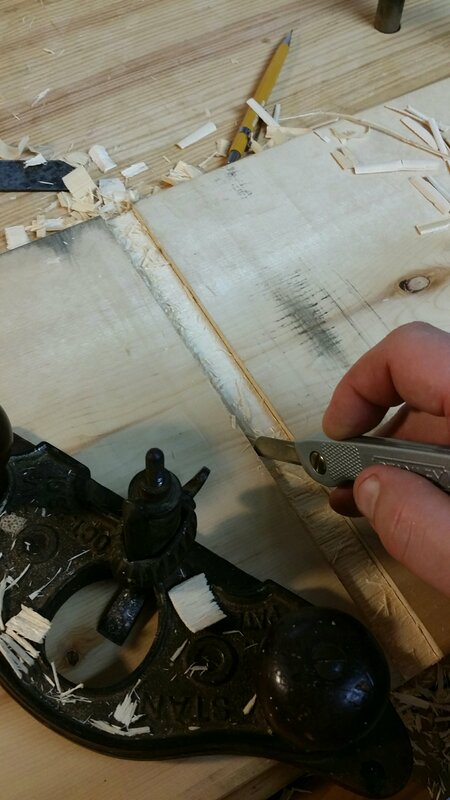 It will make you more confident with your hand tool chops and cuts later. Then I used an actual shelf board to make pencils lines to get in the ball park as Paul says. 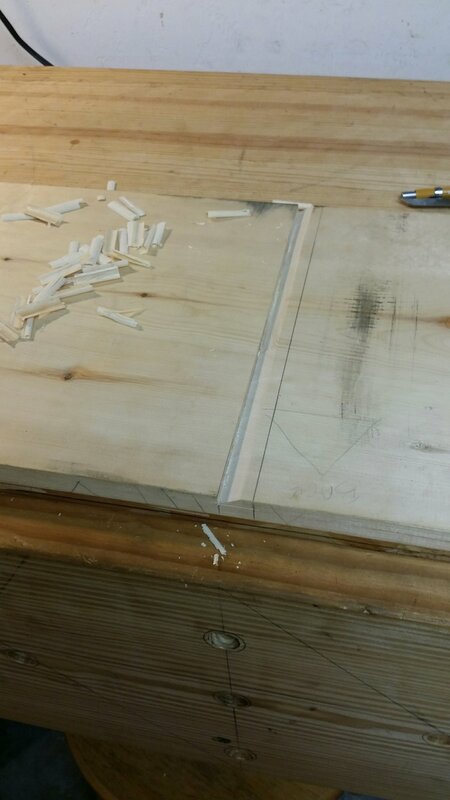 I’ll only cut the bottom and then use the board again tight up against the edge to make a knife mark to accurately define the other side of the housing. This step is key to making sure it’s a tight fit and self supporting. After squaring the lines across both boards I start by knifing in the bottom line. 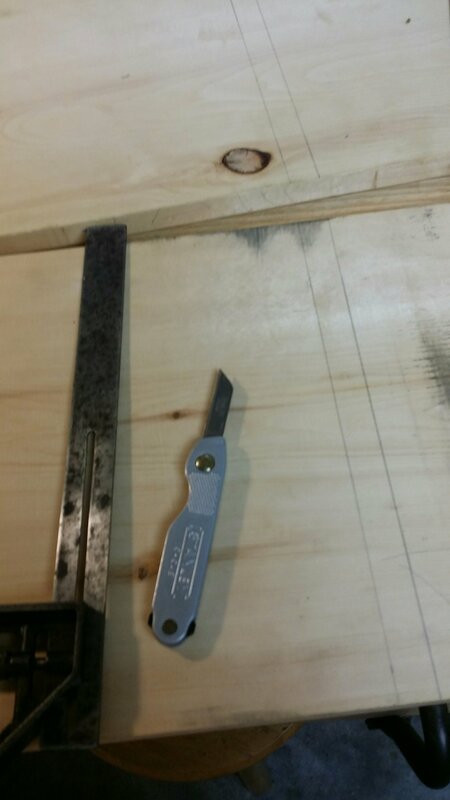 Then I use my fancy new SYP french marking gauge to mark out a 1/4 inch depth line. I almost forgot I had this. I was so excited to have a real need for it. Here I set it to a knat over 1/4. Nail worked no problem. I love the rounded smaller top. It seems to fit my hand better and I don’t feel as clumsy when I pull the line. Oops. Looks like this dog hole needs to be plugged. The hold fast hits the new vise. Your seeing me realised this for the first time. Oh well. Moved to the other side. I still love my holddowns. 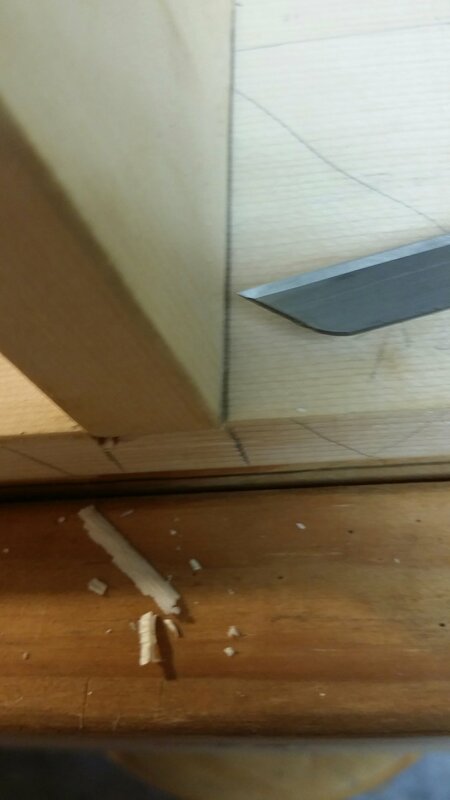 Start the dado with very shallow cuts into the knife line. 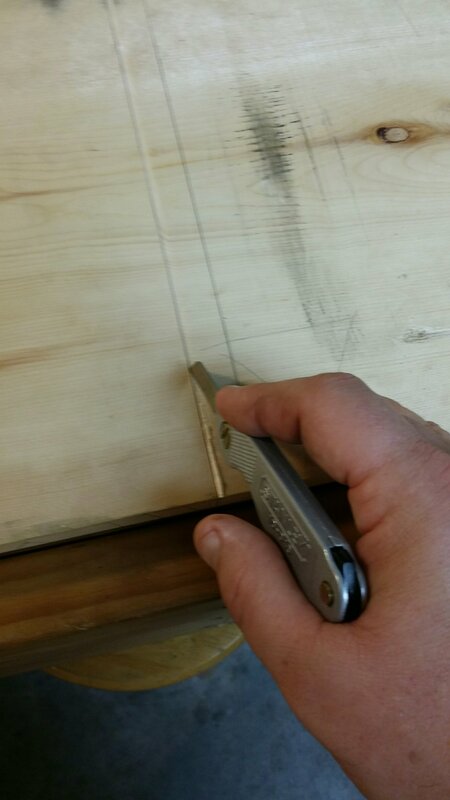 I use a technique where I use the knife to make 3 passes along the line to make the cut deeper and then I chisel in again. Rinse and repeat. Most folks use a series of vertical chisel cuts to do this, but I kept screwing up my edge wall. I accidentally discovered when making a bunch of shelves for my bookcase that running the knife every time is quick and easy and precise. I do every dado like this now. Chop only one side down. This is Paul’s technique for getting self-supporting dados. Once you are down on one side you use the actual shelf to find the distance of the other side. Doing this process and having the joints come out really well has taught me that you don’t have to measure everything and that you can size pieces to fit. This has other positive side effects. 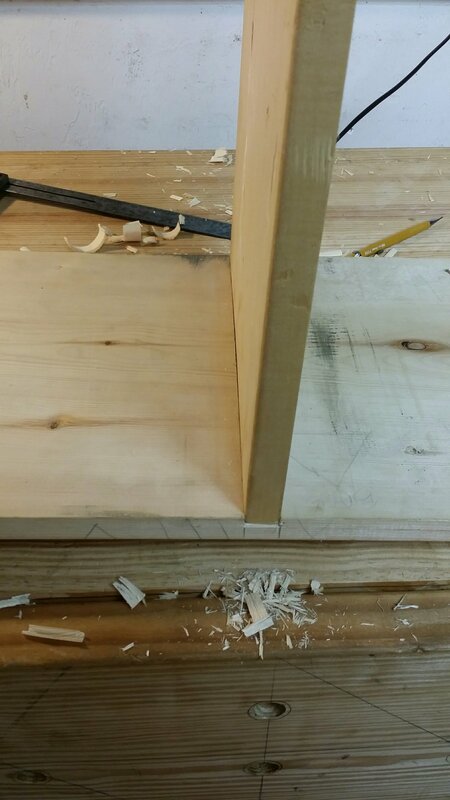 I had no idea if the two shelves were the same thickness after planing and I didn’t care. I knew I’d fit each one to its joint and that they’d be tight. 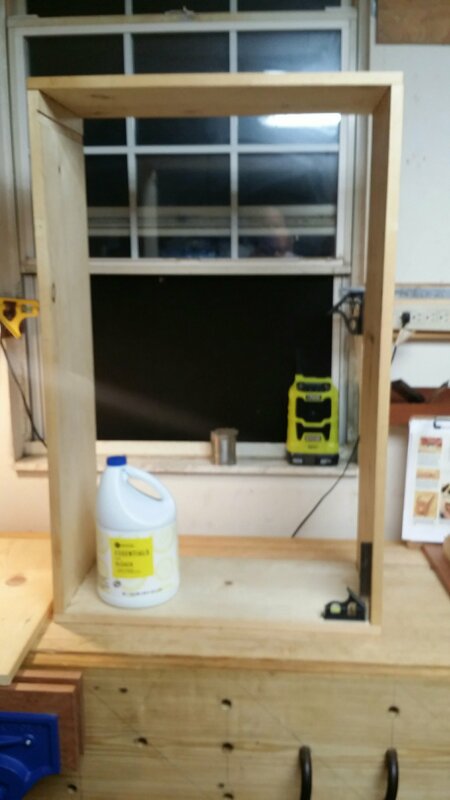 If, like when I was a table saw guy, I just setup the machine and ripped out all the dados I would be unhappy that the shelves were sloppy. I’d then think I needed a better table saw and think about how many more thousands of dollars I would need to get a better saw. 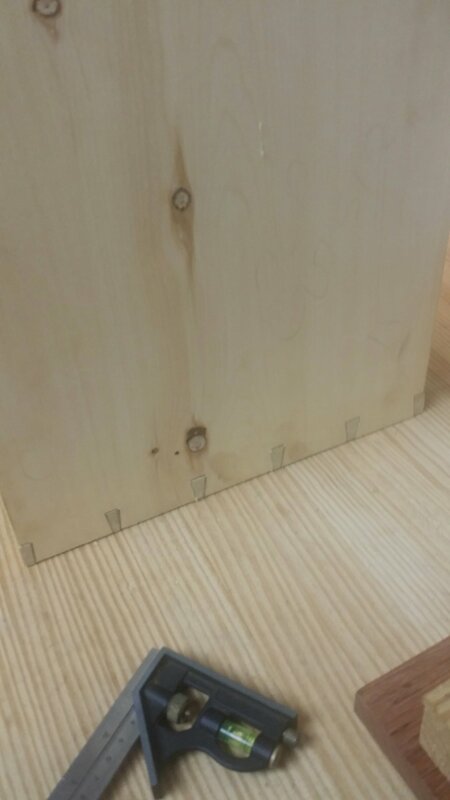 I think I made these perfect self supporting joints with a 19 dollar chisel, a 6 dollar knife and a 3 dollar pencil. 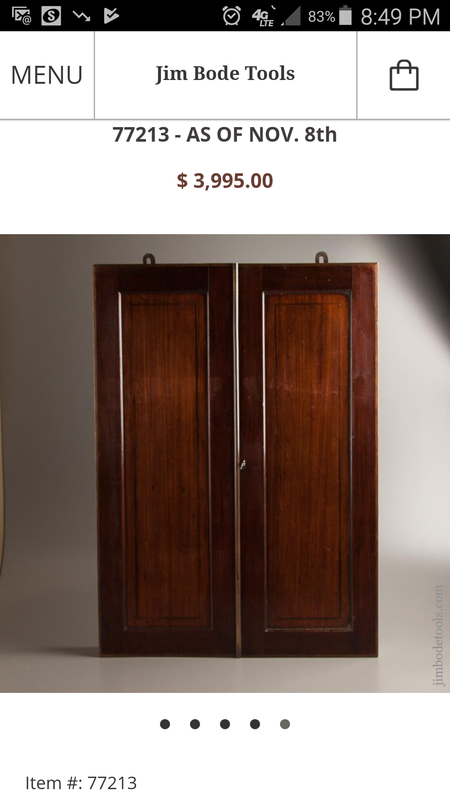 Cheap in comparison to the cost of a dado stack, much less a table saw. Use the actual shelf to knife in the opposite dado wall. Tuck it as tight as you can into the recess you already cut and then try to reach under the opposite side with a knife. Don’t worry of you make the dado a little narrow. 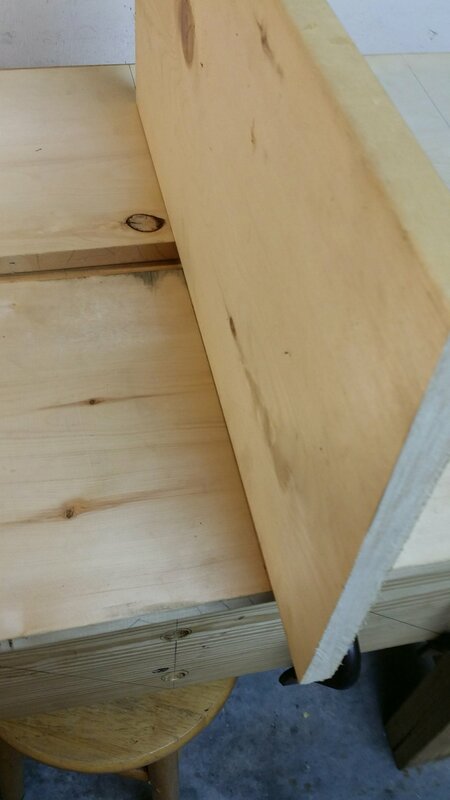 For one thing, I knew the pine would compress a little, actually I was counting on it, for another I could have planned a few thousandths off the ends where the fit into the dados. 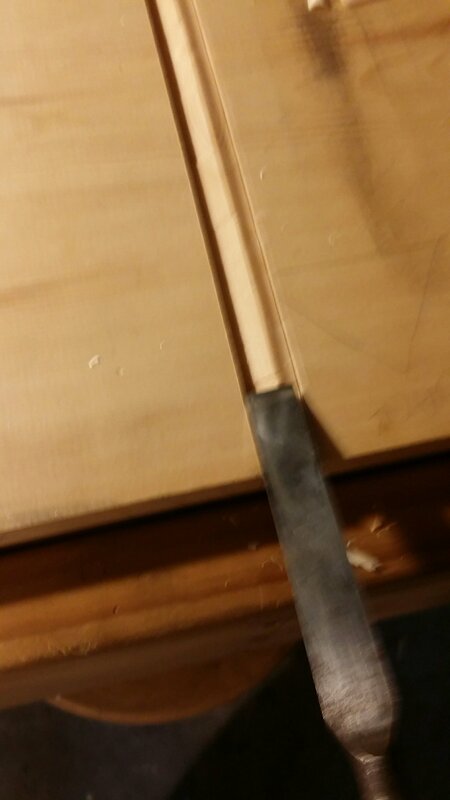 After knifing a line for the opposite side, I chisel in a small amount. and then rinse and repeat. I’m trying to make a pyramid shape in the middle and be down to my gauge line on both sides. 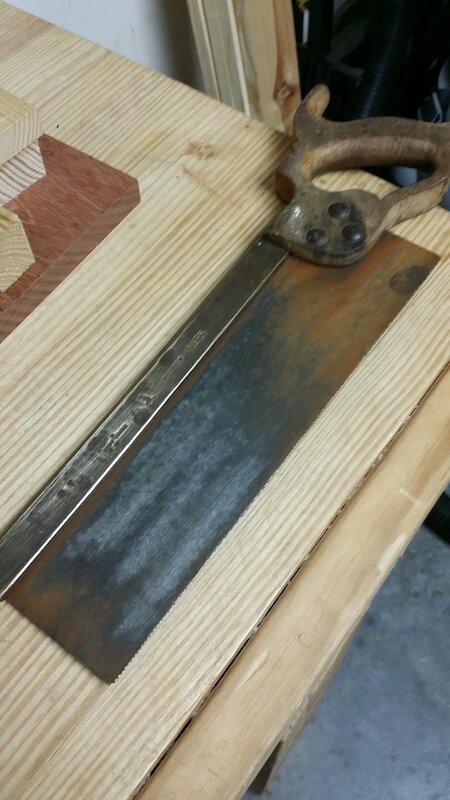 Then I’ll use my rusty chisel bevel down to slice out the waste. Before you flame me, I do try to keep my chisels and planes rust free, but my unheated space in Florida just creates rust in a matter of hours. I have sanding sponges and specials oils and I clean and oil them after use, but I still gets rust. I have been reading alot lately on plane restoration and watching ‘the plane collector’ on youtube. He does an amazing job restoring planes, and he uses minwax paste wax for rust protection. This weekend I’m going to try waxing all my tools. Fingers crossed. Dado after bevel down chisel cuts. Tahh Dahh! Self supporting Joint. Now do the other 3. Laundry Cabinet Case Dovetails fit, ready for shelf dados. Finally getting back to my laundry cabinet build. The vise is mostly mounted. I haven’t written the longer post yet, because its a pain in the rear end to write a long post with pictures from my phone. The app locks up, but all the pics are on my phone. I’ll figure it out. I’m happy with the dove tails. The case is square and I think all the gaps will close up on the inside when I clamp up during glue up. Gaps here. The outside looks good to me. Not too gappy tails and pins. Here’s a shot of the side. It’s 38 inches tall and 24 wide by 11 1/4 deep. All the pieces are left overs from my bookcase build. I like that I’ve gotten to a point where I can fit pieces to the design and not be tied to a cut list. All the dimensions were determined by what cutoffs I had. 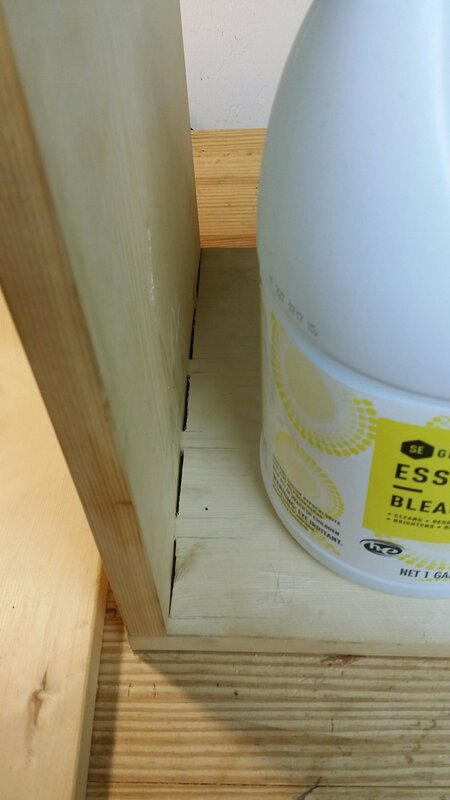 You can see that I’m determining the shelf height by the size of the largest thing I think will go in, a bottle of bleach. 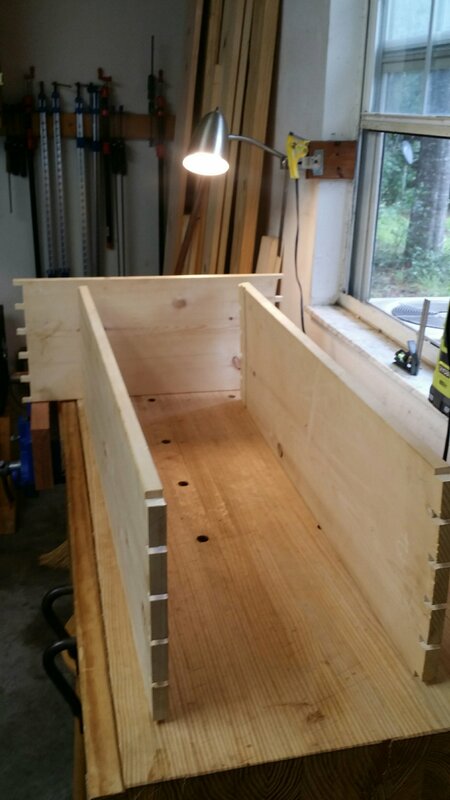 I’m putting 2 shelves in and I’ll use housing dados. 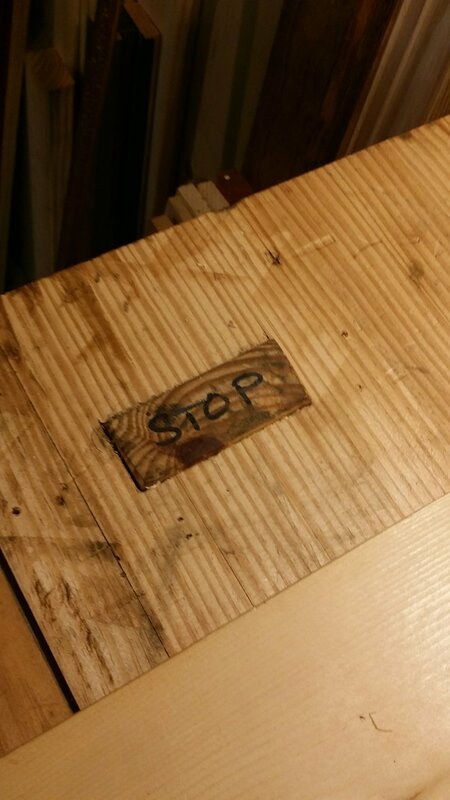 Here’s a shot of my planing stop for Brian Eve. It took so much sizing and fitting, I didn’t want it to get thrown away, since it’s just a piece of syp 2×4. I also wrote stop on it so I’d know which side is up. It works really well and I’m glad I made it 4 inches wide. 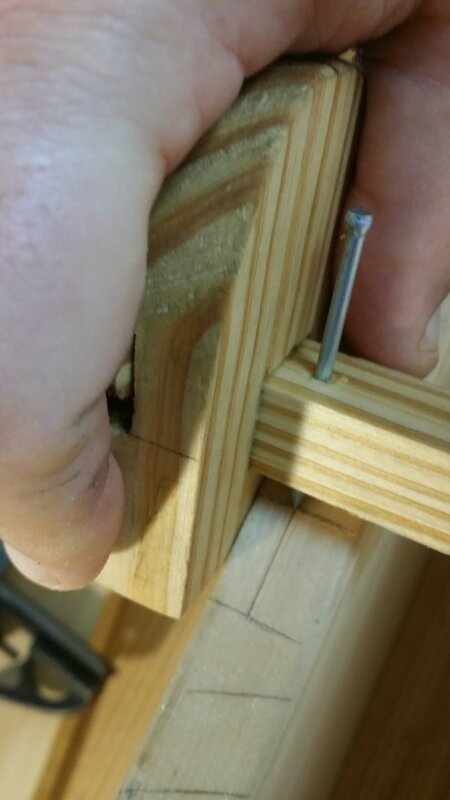 I rarely, if ever, clamp or holdfasts a board down when I use it. It’s about a year old now and hard as a rock. Had a great day in the shop, but I did go out this morning and look what followed me home from the antique mall. 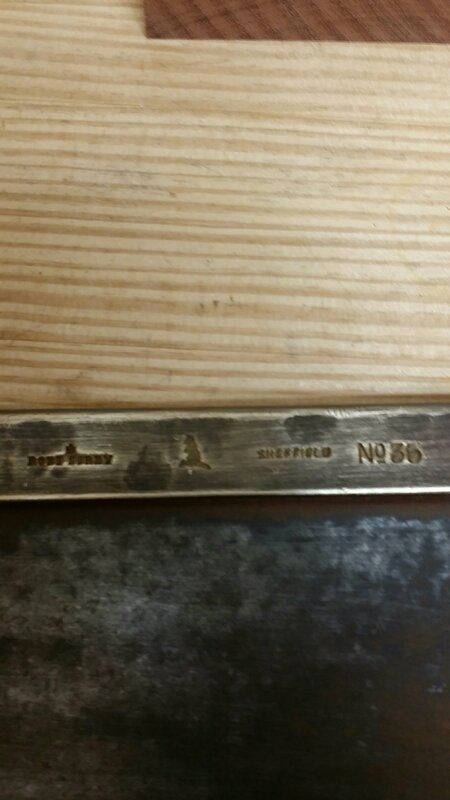 A Robert Sorby No 35 12 inch brass back saw. 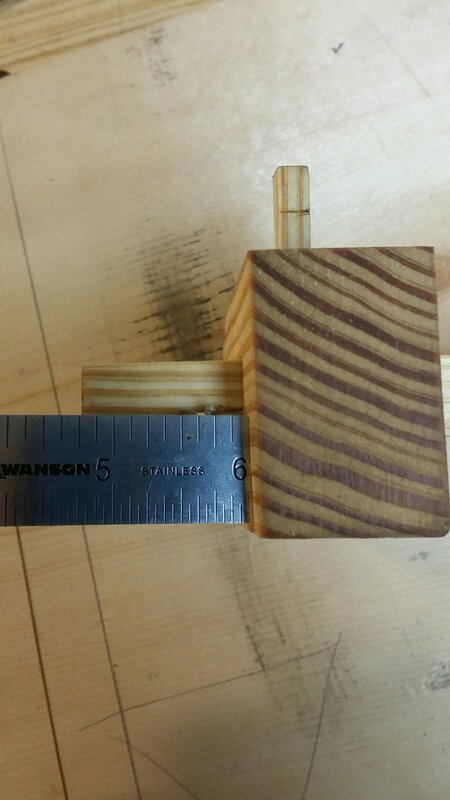 It had a kink in the back, but I used Paul’s pull it/slide it out of the vise against the bend method. He demonstrates this with a gent saw but after a few pulls it straightened mine right out. It was owned by some fellow named P Thomas. I got it for 25 bucks. Mr. P Thomas rehandled it I think, since the saw nuts are steel and there is no medallion. He did a fantastic job. The handle fits my hand and there is a little cut out on the right side where your fore finger drops right in. Close up of the Sorby marks. Apparently, the Kangaroo mark means after 1847. I’m guessing 1900? Anyone who knows more I’d love to know. 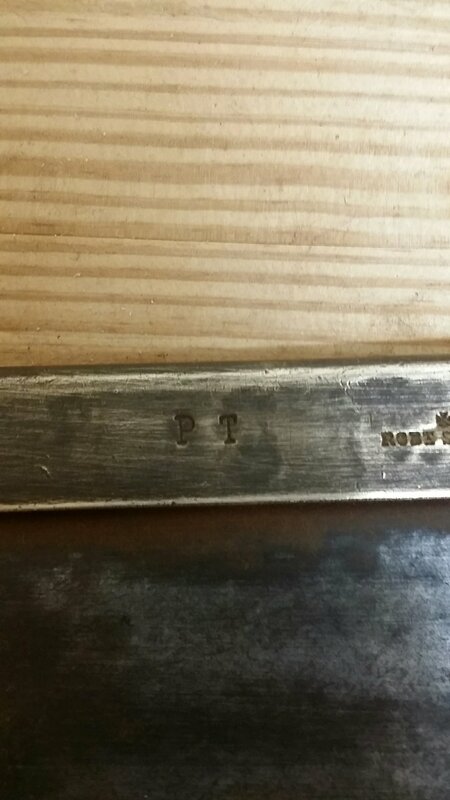 Mr. P THOMAS also put his mark on the back and the handle. I haven’t decide how much to do. This will be a user for me, but she does need some love and a sharpening. I’ll probably sand the plate to get the antique store shellac over rust off. Then I’ll probably lightly sand and oil the handle. I want to keep the P Thomas mark. I think it deserves it. I hope where ever Mr P Thomas is he’s glad his saw will go back into service. Although I can say with certainty that he must have been better with it than me ;), but I’m getting there. Take Care and thanks for reading. I humbly say thank you. My Humble little shop with my first large book case on the bench, getting the last cross rails and kick plate fit in. Its taken me a few days to get my thoughts together to write this post. I want to start by saying thank you to the anonymous person(s) that recommended my little blog to unpluggedshop.com. I can truly say that Paul Sellers and the great folks he works with have truly changed my life for the better. So too, have all the great blog writers that contribute to the daily feed I read everyday on unpluggedshop.com. 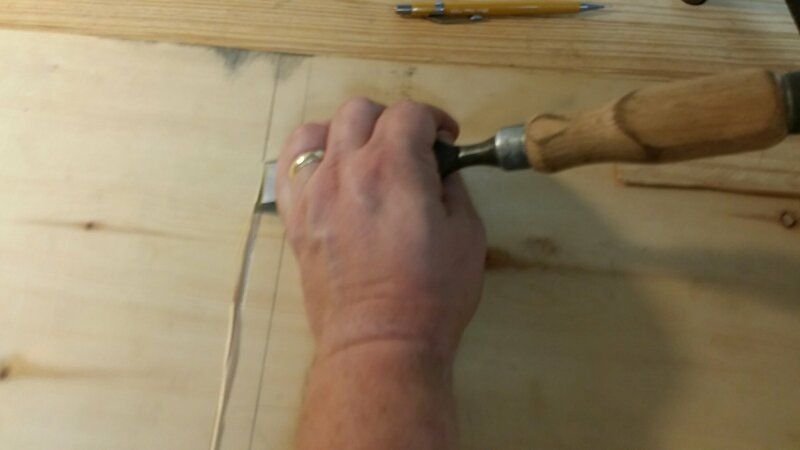 Writers and woodworkers like Ralph Boumenot over at accidentalwoodworker.com have shown me that persistence and working through mistakes and failures are what make you a better woodworker and a better person. I truly thank all of them. So here’s the funny-ish story. About a year ago to the day I had taken my then 81 year old mom to the ER because I thought she had the flu. She didn’t. She had a type of cancer called multiple myeloma and it had caused her kidneys to fail. She was dying. That was one of those moments where you thought you knew what the world was all about and then 30 seconds later the world is changed in a way you never could have foreseen. Twelve months on and many medical visits later she is doing great. She still lives on her own, around the corner from me and my family. She has 4 grandkids to keep her busy. Things are good. Just before mom got sick, I had started one of my most ambitious pieces. A 6 ft tall 3 foot wide bookcase with all hand cut stopped dados and stub tenoned cross rails. I designed it and drew out all its critical dimensions by myself, based on Paul’s book case, but more square to my liking. I was very proud of the design. Surprising myself, I dimensioned all the boards and had all the shelves cut and fit, the top cap cut and fit, and the first of 3 cross rails cut and fit. Then I had to put all woodworking down and not touch it for a year. All my woodworking at that time was arm chair, but reading all the great work on unplugged shop everyday kept me sane. Ralph, in particular, is a machine. He writes a post every day and posts it at ohh-dark-thirty, so it was my first read almost every day. Thank you Ralph. Dr. Visit days, Chemo-therapy days, Dad Soccer coaching days, Ralph and unplugged shop was always there for me. So this summer. I rearranged my shop and forced myself to get back to the bench and finish the bookcase. I did it. What’s more, I felt like writing again. So I blogged about it. Then it was easier and easier to both get back in the shop and to write about what I love to do. So here’s the funny part. The ‘you thought you knew how the world worked part’. Sunday morning September 24th, 2017 I was actually thinking to myself. “Hey if I can keep this up for the next 2 or 3 years I can build up a body of work like Ralph, Brian Eve or Bob Rozaieski and then maybe someone will think my stuff is good enough to be on Unplugged Shop.” Then at about 10:30 PM I posted a progress post on my Eclipse Vise install silliness. 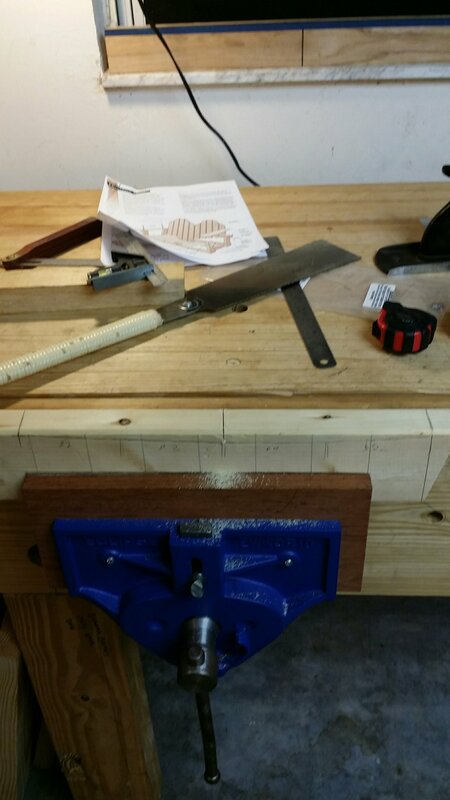 As I was closing up the shop to go to bed I sat down to stare at my bench for a few closing minutes. Ok, don’t judge. At the end of the day I sit and stare at my bench because it makes me happy. This night I was as happy as I could be. 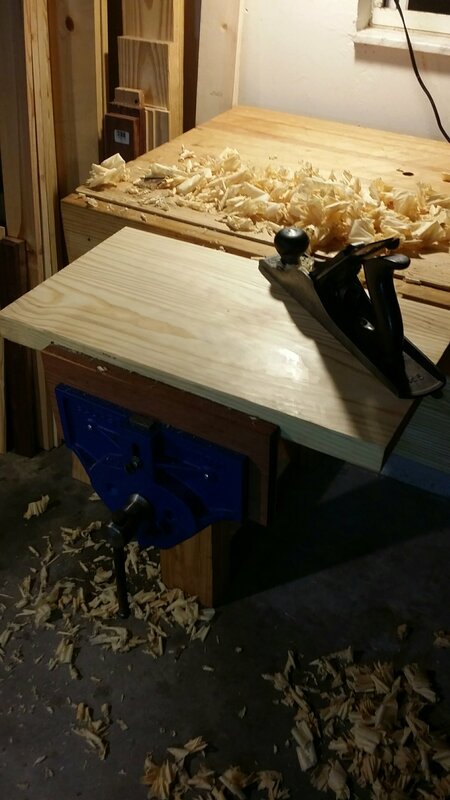 I had a new massive 10 inch vise that I’d waited four years to get hanging off my bench. The world couldn’t get any better. And then it did. I picked up my phone and decided to see if there was anything new on unplugged shop. Then it happened. There was my ugly mug and the post I had just made. I was speechless. I ran into the house to show my wife and try and explain it to her. She was super supportive, thank you honey I love you. But who else could I tell, unless you are a blogging woodworker I don’t know if you really get what an honor it was to me. I was and still am dumbfounded. So, to all of you out there, thank you and I will try to maintain the high standards of the great work you do. So I say again, humbly, thank you.